For Laurie Nanni, life will never be the same after the Las Vegas Route 91 Harvest Festival shooting. Going above the call of duty is synonymous with being a teacher. We don’t do it for teacher-of-the-year awards. They only collect dust. We don’t do it for extra pay. That will never happen. We do it because our teacher hearts won’t let us do anything else. This sums up speech teacher Laurie Nanni perfectly. She works at Sue Morrow Elementary School in Henderson, NV, where I teach kindergarten in an adjacent classroom. Back in 2004 when she was teaching second grade, a brown-eyed boy with a contagious spirit that could illuminate the room walked into her classroom. 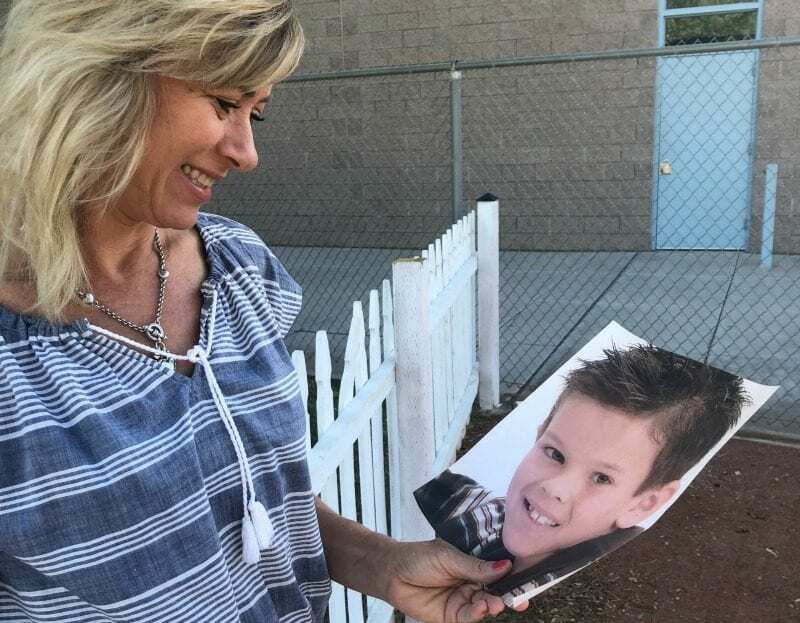 His name was Quinton Robbins, and though Laurie loved all her students, she had a special bond with him that would last a lifetime. Laurie remembers Quinton in second grade. When your teacher heart gets shattered. On October 1, 2017, my Las Vegas community was completely shaken to its very core. In one of the worst mass shootings in US history, a shooter opened fire on the Route 91 Harvest Festival, from a suite on the 32nd floor of the Mandalay Bay Hotel, killing 58 people. 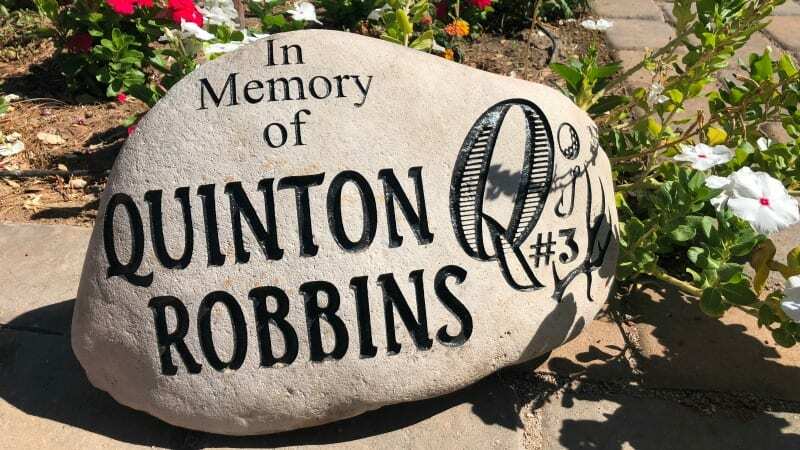 Quinton Robbins, age 20, was one of the victims. Days after the tragedy, I could hear Laurie’s guttural sobs of anguish through the walls of my classroom. The boy everyone knew as Q was gone, and sense was nowhere to be found amongst the devastation. Quinton had built up a bit of a reputation as an incredibly kind and friendly person. He coached basketball and made friends with everyone. Many people were at a loss for how to process and move on, and then Laurie figured out a way. Spreading kindness through gardening and a buddy bench. Laurie recalled one of her favorite stories about Quinton as a second grader and how he always had a deep understanding of friendship. 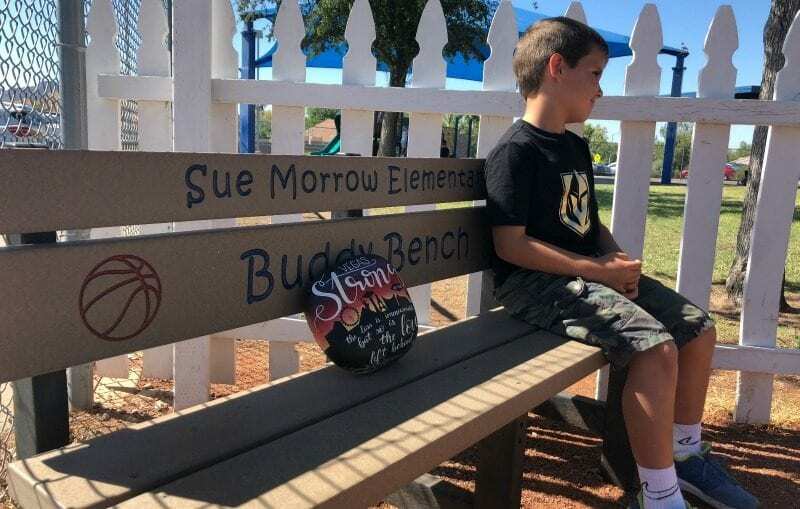 The new buddy bench at Sue Morrow Elementary. Laurie wanted to add a buddy bench to our school in Quinton’s honor. Buddy benches are made for students who are lonely and are looking for someone to play with. They sit on the bench to signal to others that they need a friend. Laurie knew it would be a perfect way to remember Quinton and keep his positive spirit going at our school. “If these benches were around when Quinton was young, he would have been the first one offering up his friendship,” Laurie said. Laurie’s efforts didn’t stop there. She wanted another way to pay tribute. So she took a cue from the LV Community Healing Garden in downtown Las Vegas. They had built a memorial garden, in three days, as a way to remember the victims, so Laurie wanted to do something similar at our school. 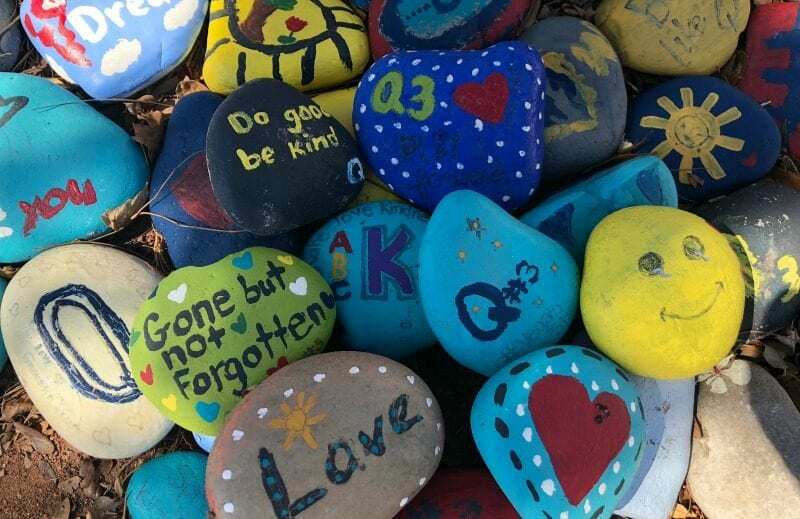 The kindness garden helps this school remember Quinton. The garden is right in the playground area for students to see. Along with the plants, we have painted rocks. Students, parents, and teachers have created these and added them to our collection. It’s a way to encourage positive messages and spread kindness throughout the school. It has been a year since a joyous evening was interrupted by the unthinkable. The effects are long lasting, but people like Laurie have made a difference in the community. We need love and compassion like this to drive out darkness. 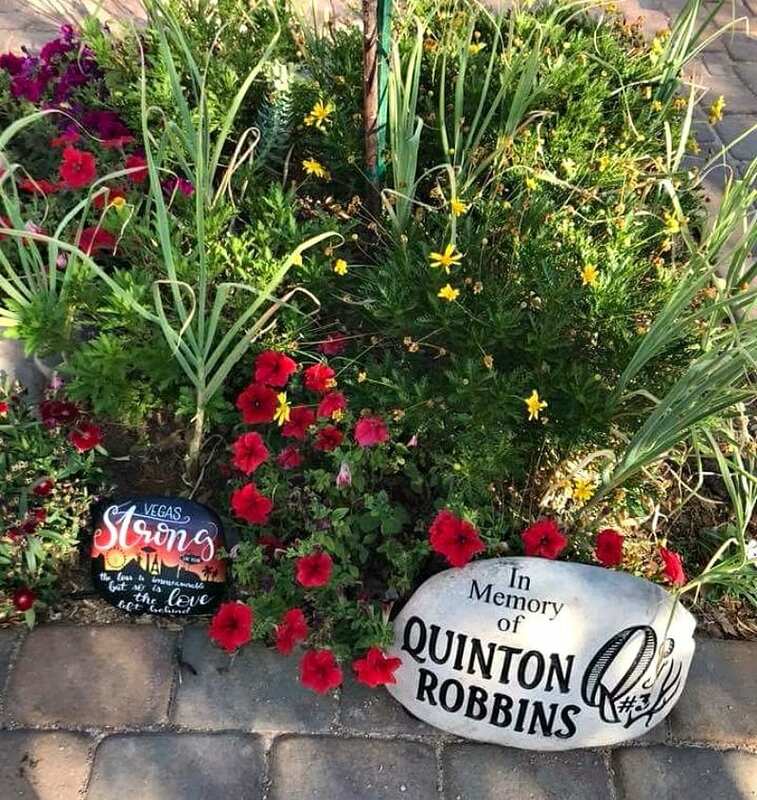 Quinton’s family has created the Quinton Robbins Play It Forward Foundation, which provides sports scholarships to students who attend the same schools Quinton did. Laurie, who shares a close friendship with the Robbins family, continues to find her own way to pay it forward, too. Spreading messages of kindness and friendship is something Laurie practices and encourages every single day in her role as a teacher. 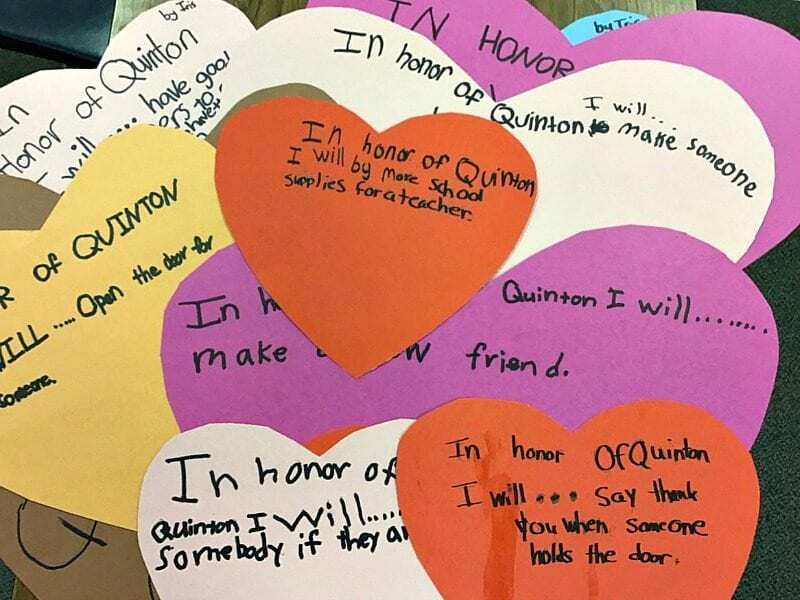 This year, students are writing messages on paper hearts to extend kindness to their classmates.